Well, it's finally time to have this discussion. What should you buy, the PlayStation 4 or the Xbox One. It helps that we've finally got some facts to work with in the new console war, instead of just chasing rumors and misinformation. 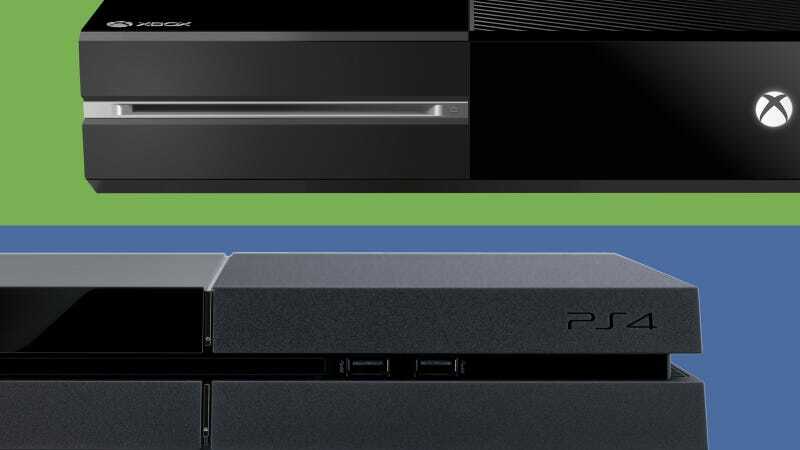 So here's the definitive look at how the two new consoles stack up against each other, and more importantly, what those comparisons actually mean. A hundred bucks is nothing to laugh at, really, even when that investment is going to spread itself out over, presumably, the better part of a decade. At $500 the Xbox One costs more than the $400 PS4, and even the bundling of a super-powered Kinect 2 isn't going to change that. There's maybe equal value between the two, depending on how much you plan to use Kinect 2, but you don't have a choice in the matter. One big differentiating factor on price—the fact that PS3 had free online multiplayer while Xbox 360 charged for Xbox Live Gold—seems to be disappearing, though. PlayStation Plus will be required for online multiplayer, at a cost of $50 per year. Entertainment stuff (read: Netflix) will still be accessible for free, though, unlike the Xbox. On one hand, the Xbox One's controller feels fabulous to hold, and the rumbling triggers are so very much cooler than they should be. They're going to make a big difference. But on sheer potential, Sony's built-in capacitive touchpad, and PlayStation Vita as a (rather expensive) PS4 controller, might be hard to beat. But! But. The PlayStation controller leaving its analog/d-pad layout unchanged, and no matter how comfortable the rest of it is (which is very! ), that's a big downer. More to the point, since the Kinect 2 comes bundled with the Xbox One, it should also be included as a default feature of the "controller." The technology in the new Kinect is truly mind-blowing. It's still probably not really for gaming, outside of some specific examples like dance games, but as a means of controlling your system-level commands, it's a massive advantage. One that Sony can't touch. It's tempting to tuck this feature into controllers, since it's obviously a controller-based feature, but this at its heart this is about gameplay. There are simply a ton of unexplored gameplay mechanics that aren't going to be used in a meaningful way with standard controllers. And in that context, the Vita as a controller, while certainly much pricier, is just flatly better than Microsoft's SmartGlass, which is janky and often unusable in its current form. And if nothing else, the Wii U has shown us that there is plenty of room for innovation with two dedicated screens for a player. There is also, of course, the Wii U itself. The Wii U wins this debate handily, but because it likely won't get many of the cross-platform games we'll see on the PS4 and Xbox One, Nintendo is off in its own category. Again. Frankly, the exclusive games rosters were a little sparse on both sides of the aisle, with many of the announcements not firm confirmations as "exclusive," just "announced for." For example, Xbox One's exclusives do NOT including Metal Gear Solid V: The Phantom Pain, though that was briefly reported. As it stands, the big standouts for PS4 weren't confirmed as exclusives either—most was exclusive downloadable content—but are exciting anyway. Final Fantasy XV (formerly FF Versus XIII) and Kingdom Hearts 3 are both big wins for the console, even if they're only arriving there before the Xbox One. Microsoft showed a new Halo, Ryse: Son of Rome, Killer Instinct, a new Forza, an actually pretty cool murder mystery called D4, and the supposedly TV-crossover Quantum Break, but none of those really landed flush the way Microsoft needed them to after inadvertently stepping into the hornets nest of gamers. So Sony probably takes this round, but honestly, the best thing to come out of yesterday was this awesome PlayStation commercial. The numbers say PS4. The numbers are proooobably right, especially considering the Xbox One's bifurcated operating system. We have every reason to believe Sony's system will have a decent advantage graphically, but frankly, we're also skeptical that that will materialize in a meaningful way in cross-platform games, and even among exclusives (which, again, there aren't many of) it's questionable how much of a difference you'll actually see. The more pressing concern for those few non-connected users might be how much of its workload the Xbox One will shift to its Xbox Live servers (though reason stands that a lot of that will be for persistent, online worlds, at least to start). For now, though, it seems fair to give the PS4 the advantage, but wait until we're playing finalish games to declare a true winner. That said, this is going on the presumption that in practical application the two systems will be relatively close, given some of the underpinnings Microsoft has included under its broader raw specs (like sRAM on the SOC). In the sort of unlikely event that that turns out to not be the case, and the PS4 is actually head and shoulders ahead, it would obviously be a massive advantage for Sony. Don't hold your breath for that, though. In the immediate afterglow of a very fun day one of E3, it's easy to forget just how hopeful an endeavor launching any gaming console in 2013 is. Our technology culture is just not built around making anything last for six, seven, ten years anymore. Remember, all of the current generation consoles were released well before the original iPhone came into the world. We dispose of technology far more rapidly than we did back in 2006. So the Xbox One's cloud computing, which uses 300,000 Xbox Live servers to render portions of some games that are heavy on workload, gives it a better chance to soldier on after its guts can no longer keep pace. Same goes for its uses in the living room. There's no guarantee that it'll pay off, but how long they'll be playable should be a massive concern for both consoles of this generation. Well, the Xbox One had better win this one. And it's not just that the Xbox One beats out the PS4 for home entertainment; the Kinect 2 might make it the most sophisticated way to control your living room (and eventually, your entire home) that exists. Its main virtue is the voice activation for all your stuff, which is made possible by some very cool tech, like understanding what sounds your system is producing and ignoring those so that it can focus on your direct commands instead It partners that with content partnerships that Sony just doesn't have in place yet, like with ESPN and HBO Go, and full cable box functionality to make it the most powerful media box out there. No restrictions on how you handle games you buy as discs is a huge point of differentiation for the PS4. People are very up in arms about the Xbox's policies restricting how often you can give away a licensed game, and possibly which you can trade in, and Sony capitalized by just side-stepping the whole mess. Sony's official policy is that its first party games will not have any restrictions, but that publishers will be able to impose their own. In practice, this is actually very similar to Microsoft's, which leaves the decision on allowing resales up to the publisher as well. But do keep in mind that there are benefits for the user for abiding by Xbox One's restrictions, at least hypothetically. Being able to trade in your game licenses to retailers instead of physical copies sounds like how you want to be exchange games from now on. It's easier, it's more efficient, and it doesn't matter if you break your disc. Still, though, it's nice to have a choice. If you feel strongly about your computer authenticating online every 24 hours, or lending physical copies of games, you basically just want the PS4. Sony bent over backwards to ensure its policies mirror the current generation as much as possible, to raucous applause. And there's certainly no need for an always-on PS Eye, like the turn-offable-but-still-usually-on Kinect. You'll be missing out on very cool features like the aforementioned license trade-ins, as well as sneaky wonderful things like being able to turn your console on without touching a controller, but for many, that's simply not a concern with a gaming console. No one wins. Everyone must stop this. No one wants social on their gaming console. Now, if we expand the definition of social into matchmaking and the like, the Xbox's dual OS will allow you to, say, watch a movie while remaining queued for a match, or while waiting for friends to log into a Halo hub, or something. That's an advantage, but not really enough to scrub the regrettable ability to tweet achievements or whatever fresh horrors count as social these days. One has it, the other doesn't. That's about as cut and dry as you can get. That said, we still don't know what the library for Gaikai gaming—PS4's cloud gaming outlet—will look like for PS4, nor do we know how playable the format will be in 2014, when it launches. Playing a whole game over streamed computing is a lofty goal, more so than using cloud servers to handle some workload. Sony has promised that this will be a lag-free experience, but it's all promises at this point. We'll see how playable Gaikai ends up being, but it's gotta be better than nothing... right? For Dance Central, basically. Also Kinect fitness, and all the other advantages of having the Kinect, as well as the 10-person shared account for all your games. But if you're buying a console just for those big, group family settings, you actually should just get a Wii U. It's incredibly fun in group environments, and is a really capable media box as well. Hey, That's Right, What About the Wii U? Oh, erm, right. So you can also get a Wii U. It's significantly behind the PS4 and X1 in specs, and hasn't had nearly enough games so far, but it's got full backwards compatibility with the Wii, no restrictions on any of its content (besides Nintendo's weird digital account stuff), and is less expensive than the PS4 and X1. For now, there is just no getting around the PlayStation's less fumbling rollout. All of the Xbox One's good qualities—ease of use in your home, Kinect magnificence, cloud rendering, possibly super easy trade-ins once the license stuff gets sorted out—are off in the future. They're distinct possibilities, but the PS4 is the bird in the hand right now. It's not made of a bunch of hypothetical parts that may or may not come together. Just know that if everything does work out for Microsoft, it's going to be a very impressive alternative.